Dayton Corsa & Co. (1915) was the successor to Keys, Corsa & Holley, tea importers at 17 Hubert St. (New York City) founded around 1901. The principals at Keys, Corsa & Holley were Charles H. Keys, Dayton Corsa and Spafford Frank Holley. Keys had been in business as a cooper and dealer in staves since 1887. 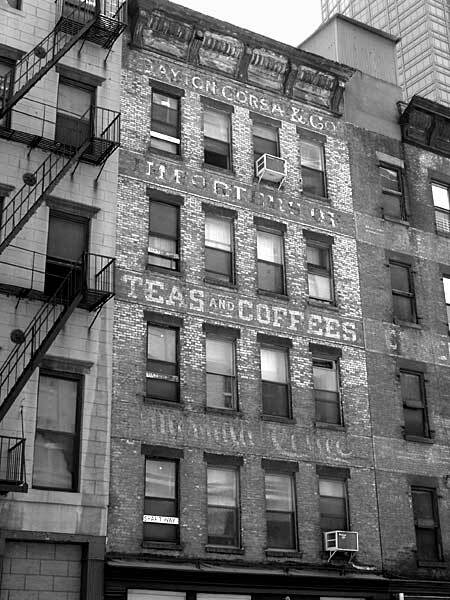 There had been an earlier Keys and Corsa, tea importers, at 198 West Broadway in 1898. Dayton Corsa & Co. imported tea and coffee. They were located here at 17 Hubert St. from 1915 until approx. 1933/34. These signs were probably painted around the time the name changed to Dayton Corsa & Co. - i.e., 1915. Next door (to the right in this picture) is the home of Morrison & Boinest at the corner of Hubert and Greenwich Streets.